Looking at this stunning new picture* from the European Observatory (below) you’d be forgiven for thinking that this is a region of calm beauty, hanging in interstellar space. This is the object known as Gum 29 – a huge nebulous region of ionised hydrogen gas sitting around 26,000 light-years from Earth just on the outer part of the Carina spiral arm of our galaxy, the Milky Way. Whilst the swirling clouds of gas do look serene, they are detracting from a maelstrom of violence which is being perpetrated by two massive stars within the cluster, at the heart of the nebula. The cluster is known as Westerlund 2 and it is the location of a binary star system (known as WR20a) composed of two huge stars with masses of 82 and 83 solar masses. 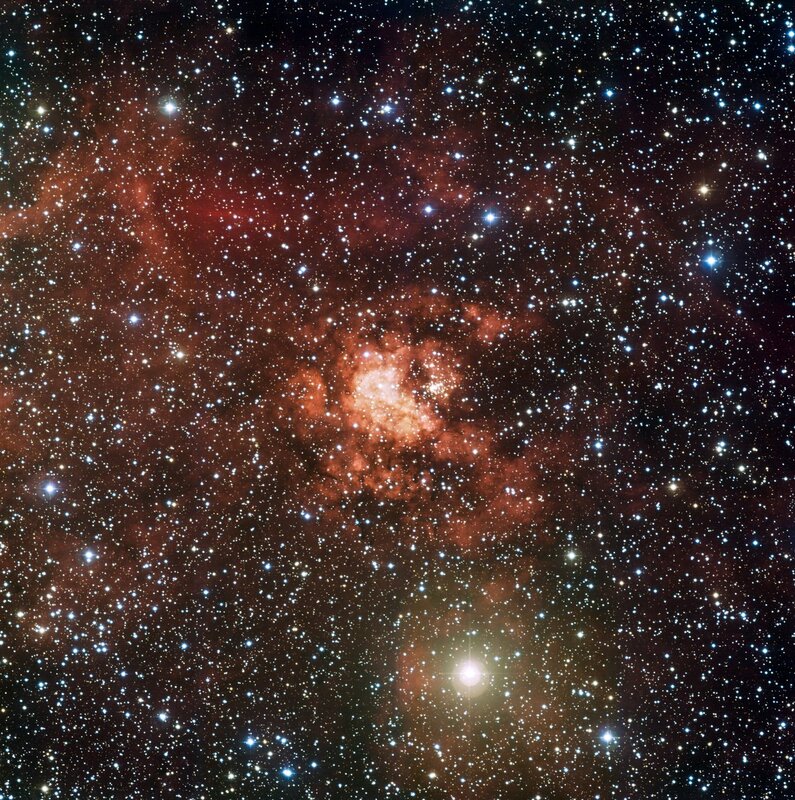 These stars are on the verge of dying and are classified by astronomers as ‘Wolf-Rayet’ stars. These are stars that are ejecting huge quantities of material (like gas and dust) as they go about the last stages of their lives. As they eject this material it is lofted on strong stellar winds which rush away from the stars at incredible rates, sometimes as quickly as several thousand kilometres every second. The binary star system of WR20a is circling every 3.7 days and as it does the stars’ respective winds buffet each other. The result is a violent collision of gas which prodcues a flood of X-rays, that can be seen by X-ray observatories like the Chandra Observatory orbiting Earth. This blast of X-rays can be seen in the X-ray image here (from Chandra) as a yellow fuzzy blob, towards the bottom right of the cluster. You can also see the (visible) light, from the system, in the image below. In time the stars of the WR20a system will die, as their cores collapse, most likely creating a blast known as a supernova. That’s going to be an incredible sight when it happens and we’ll have a front row seat, if we’re still around. Astronomers are interested in studying these incredible objects as they can then get a better understanding of what happens to massive stars at the end of their lives and refine their models of stellar evolution. It’s thought that most extremely massive stars in the Universe will behave like WR20a and become Wolf-Rayet stars prior to exploding as supernovae. But there are still some stars which throw the proverbial spanner in the works. Take Eta Carinae for example (below). It’s an odd, extremely massive, rare type of star known as a luminous blue variable. It’s been expelling huge amounts of material for a long time and is four million times more luminous than our own, rather meagre in comparison, Sun. Today we see the star surrounded by two huge lobes of pinkish gas, each formed during one of the star’s larger ejections, seen to appear in the early 1840s. Some astronomers think that Eta Carinae is exhibiting Wolf-Rayet star like properties due to this extreme behaviour, and may even be on its way to becoming one. But astronomers from the Gemini Observatory have recently found that the material moving out from Eta Carinae is travelling much faster than if it was being swept on fierce stellar winds. They have found that the gas and dust flying away from the star is moving away (at speeds up to 6,000 km/s) with a little less energy than you might expect from the blast of a supernova. Below you can see a wonderful animation depicting the scenario, with a blast wave emerging from the star. That blast wave excites the gas from previous ejections and we begin to see the familiar shape of the two lobes around Eta Carinae, that we see today. But the star hasn’t gone supernova, so what’s going on? Well astronomers don’t quite know at the moment and so it seems Eta Carinae has become just that little bit more interesting and peculiar. Some argue that perhaps Eta Carinae is similar to other stars which appear to have released an explosive amount of energy at the end of their lives, yet haven’t gone supernova. However, as yet, there’s no concrete theory on how these stars might evolve (at the end of their lives) and what may trigger their violent ejections. Maybe we are looking at a new type of stellar explosion? Even so, if we aren’t sure what’s happening with Eta Carinae, will we actually have enough time to study it to find out? Well the answer is yes, it looks as if we’ll have a little while yet. Astronomers from ESO think that it might be 10,000 years from kicking the bucket. That’s still very soon in the lifetime of a star mind you. Nevertheless, it appears that Eta Carinae is going to be intriguing, at least several, generations of astronomers for millenia to come. 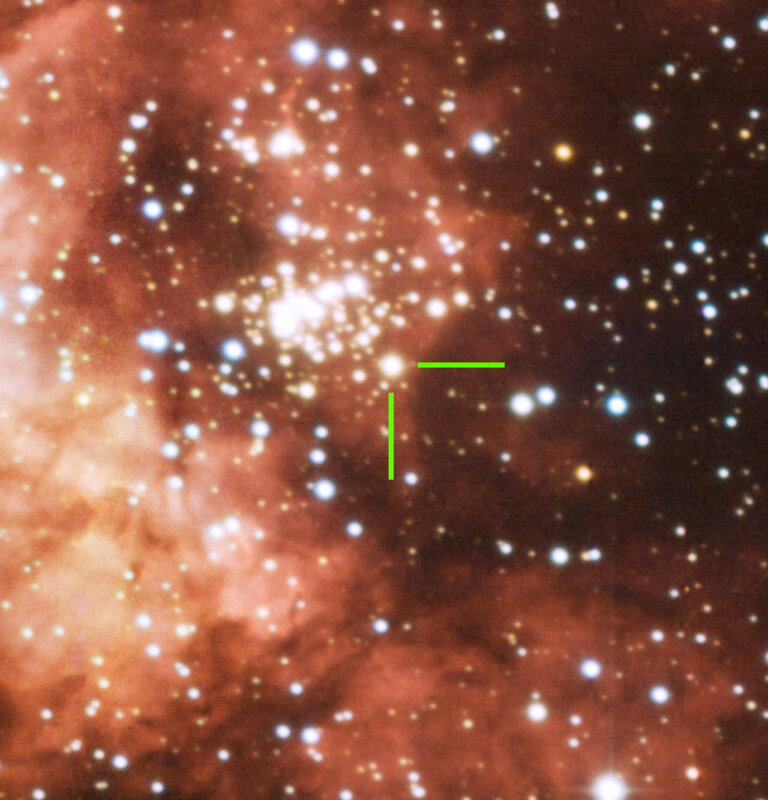 Eta Carinae’s expanding shells. Credit: Gemini Observatory, artwork by Lynette Cook. *I recently finished writing the press release for the Gum 29 image and you if you’re interested you can read it in full on the ESO website here.